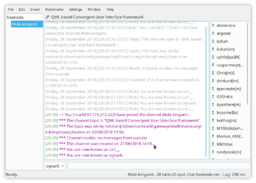 Difference between revisions of "Konversation"
Konversation is a user-friendly Internet Relay Chat (IRC) client, giving you access to a large number of chat rooms dedicated to all manner of topics, including user support for KDE and most distributions. While ideally suited to users new to IRC, it also provides many powerful features for advanced IRC users, allowing you to gently grow your IRC chops during use. Tight integration with KDE, including support for connecting users in chat rooms to KDE addressbook entries, makes for the best possible IRC experience for KDE workspace users. Konversation is part of KDE's Extragear suite of applications, and its homepage is found here. Easy management of multiple IRC user identities. Per-channel encoding settings for international users. On Screen Display for notifications. Collaborative drawing (think "multiplayer Kolorpaint").